But a look at the lecture she gave makes clear she felt Pearl was a hero and the victim of a brutal crime. She extolled journalists like him and touted the need for freedom of the press to hold leaders to account around the world. She might have mentioned her own administration’s bullying of the press – including attempts by the president himself to intimidate Fox News – and the recently uncovered plan to have the FCC to install its goons in newsrooms to “research” how they do their work. Power’s real crime here is not that she is holding Pearl responsible for anything. It’s that she’s holding us responsible. I think (Daniel Pearl) would be very proud that the Foundation established in his memory is dedicated to inter-cultural understanding. Given the circumstances of Daniel Pearl’s death, we should recognize how remarkable that is. Much of the world’s sorrow can be traced to cycles of retribution, where one group seeks revenge for real or imagined wrongs done by another. That was the ugly mindset of the men who murdered Daniel Pearl because he was a reporter, an American and, most of all, because he was a Jew. In that infamous video, the killers advertised their ruthlessness, betrayed their faith, and sought further to inflame passions that divide the world. Not long thereafter, the Daniel Pearl Foundation took its brave stand on the opposite shore, guiding us toward a more profound response to hate: urging dialogue, shared learning, reconciliation, and a recognition that individual — not collective — accountability is required to break cycles of violence. Notice the presuppositions here. The assertion that we are involved in a “cycle of violence” suggests both sides are instigating atrocities like the murder of Daniel Pearl by reacting in hateful ways that lash out at entire societies rather than at a few bad apples within them. It’s a cycle, she says. Both sides do it. We succumb to hatred, and so do they. And so we are breeding the monsters who killed Daniel Pearl. Well, that’s not how it happens. The United States, which is a force for good in the world, reluctantly reacts when it is attacked and does its best to focus its response on the individuals who kill Americans. When a government is protecting those individuals, then the government and its military may be attacked as well. But it’s a legitimate response. Self defense against very bad people. Not a mindless cycle. Samantha's a little off kilter. The same goes for the Israelis, whom the moral equivalence crowd -of which Power is a charter member – find the most sumptuous of targets. We are not the same as our enemies, and our responsibilities are different. It stretches political correctness to inane lengths to believe that there is nothing ailing about societies that produce rampant anti-Americanism, moribund economies, a disturbingly healthy population of extremists, routine antisemitism of the most virulent sort, and frequent repression of women, minority populations, and gays. Sure, there’s room for dialogue, shared learning, and reconciliation. But that’s not what’s going to mitigate the violence and dry up the recruits to kill people like Daniel Pearl. While we wait for these societies for figure it out, and help them do so to the extent we can, the answer to the aggression that emanates from them is a strong response of the right scale that will let individuals, and if necessary governments, know that crimes against us will be dealt with harshly. Peace through strength works. It’s not pretty, it’s not unfailingly successful, but it in general, it works. Sensitivity encounters with people who want to kill you and destroy your way of life doesn’t. 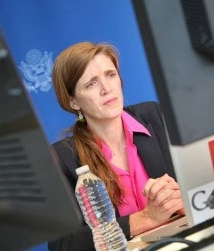 Samantha Power and her boss, President Obama, believe unreasonable people think like we do. And when bad actors know they can put one over on the United States, the world becomes the increasingly dangerous place it is today. The 7th century to the 21st is more than a cycle of violence – it’s a psychotic way of life. They’re pro-Muslim America haters, Keith. In their ideology, we Americans are responsible for the Islamists wanting to kill us, not the so-called “religion of peace”. And now he’s dismantling our military so we will be more defenseless than we were at the time Pearl Harbor was attacked. Where are all the honorable military leaders who will stand up and defend the military personnel? Cowards. I commented earlier Susan,Where are all the heros? Keith, Thanks again for a deep, and informative article. If she ever gets mugged, I would bet her attitude would be quite different. You’d like to think so, but it can go either way. I wonder if Daniel Pearl from heaven would appreciate the mission statement. Added to all this, the poor child needs a haircut. There needs to be an organization set up like the The Jewish Documentation Centre established by Simon Wiesenthal, that hunted down and help capture Nazi war criminals. If this American administration refuses to go after the people that murder Americans, then perhaps the time has come for Americans to help bring these criminals to justice. I am not advocating street justice, wherein we wholesale kill, but rather bringing in these murderers to a court that will try them and execute them if found guilty. Israel could be the country of choice, with passage of a law that allows Israeli courts jurisdiction over criminal that kill Jews. The Israelis captured Eichmann, and executed him. They could do the same for these other animals. Israel could, but won’t. Eichmann is the only case that I am familiar with and it was under ‘genocide’ and not for a single murder. Keith, here is a person who’s job is to do 1 thing. Communicate. She is supposed to be a top communicator. And she can’t even do that! Let’s imagine she’s talking to another diplomat at the UN. And everything comes out wrong. What are the consequences? EVEN if her message was right. Now the message itself is wrong. And Power has previously proven to be anti-Israel. And possibly anti-Jew. That was the best analysis and comments about that unfortunate Tweet that I have read. Well done.